A couple weeks ago, 36m visited the quad outside of my office building, and took care of our pesky deer problem. No really, he killed a deer and fed on it for a couple of nights two feet from the Earth and Marine Sciences building and about 50 feet from our Interdisciplinary Sciences Building. 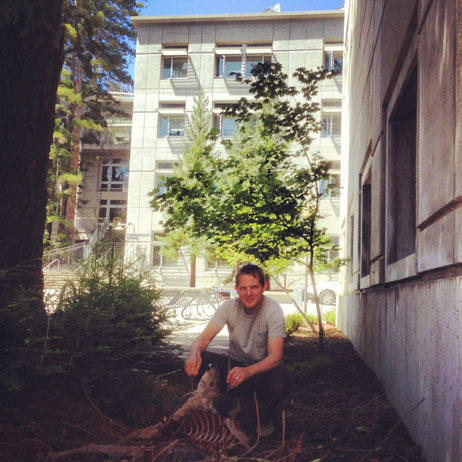 Here I am squatting next to the deer with a nice view of the steps to our building in the background. And then of course, that is 36m feeding on the same deer (the photo was provided to us by an astronomy professor who saw the dead deer and put a remotely triggered camera nearby to see what would come back to feed on it). Later that week, we downloaded 36m’s data and sure enough it shows him showing up at the spot on July 16th, and returning to feed again on July 18th. In the meantime, he makes a big loop through Wilder and Moore Creek, probably looking for females in heat. Mountain lions on campus! Making kills outside of buildings! Is this unusual? Should I be worried? Not any more than you were before you read this blog. Mountain lions have been using campus since day one. 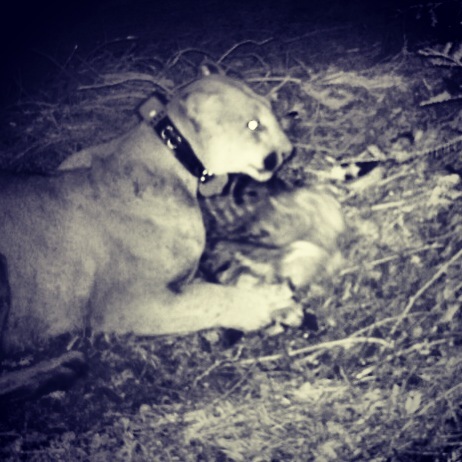 The only thing unusual about this, is that we happened to document it, and or course that the mountain lion chose to make his kill outside the office of the guy that put that collar on him. Mountain lions or pumas as we like to call them, are generally fearful of humans, but they will come close to human dwellings if there is prey to be had (e.g. deer, goats, raccoons, cats) as we recently documented in our PLOS ONE publication. This also happened during a sleepy time on campus: late at night, students generally gone for the summer etc. So if you are out at night in a quiet place where there are deer, be smart and take precautions, but don’t sweat it too much. You are more likely to be impaled by your toothbrush than a mountain lion.